Attention has focused on possible words of President Moon Jae-in, who has been playing the role of facilitator of denuclearization talks between the United States and North Korea, following the Washington-Seoul summit and Kim Jong-un’s latest speech to the Supreme People’s Assembly in Pyongyang. While agreeing to the fact that a third summit between them is necessary, the United States and North Korea showed a clear gap over the methodology of denuclearization. Washington demands a “big deal”, where North Korea relinquishes all of its weapons of mass destruction, while Pyongyang is willing to give up its nuclear weapons in a phased manner. President Moon Jae-in will likely comment on his recent summit with U.S. President Donald Trump and North Korean leader Kim Jong-un’s policy speech, a senior Cheong Wa Dae official said Sunday. The president is expected to talk about the evaluation of the summit with Trump and his expectations for a possible inter-Korean summit. “The South Korean government must be in an awkward position since the United States emphasizes our role as an alliance, while North Korea says we should be on the same side as a nation,” said Moon Sung-mook, chairman of the Unification Strategy Center of the Korea Research Institute for National Strategy. “It is actually a difficult situation to resume the stalled nuclear negotiations,” Moon added. 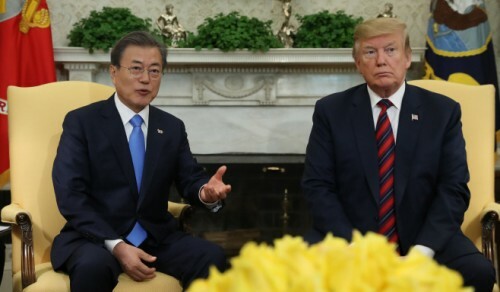 “The provocative phase is likely to continue as no one will likely to change their positions,” said Shin Beom-chul, senior director of the research division at Asan Institute for Policy Studies. President Moon is expected to reaffirm his determination to act as a facilitator of the US-North Korea dialogue. Since both leaders of the United States and North Korea have expressed their willingness to talk with each other, there is a chance that the South Korean government’s “good enough deal”, which is a combination of comprehensive agreement and phased implementation, might work. Both Trump and Kim expressed a positive attitude toward a possible third summit. There is rising speculation that Moon will send presidential national security adviser Chung Eui-yong as a special envoy to North Korea since Chung will not be accompanying him on his trip to three Central Asian countries that begins on Tuesday. “Moon is likely to comment on the issue,” a Cheong Wa Dae official said. Some experts say the South Korean government should be patient and take time to lead the denuclearization negotiations.